Male (left) and female Yellow-legged Meadowhawks (Sympetrum vicinum) coupled in flight. I thought dragonfly season was over. I’ve seen few of the beautiful beasties buzzing about in recent weeks and believed they were gone with the summer. I was wrong. Today we visited the Silver Creek Metro Park, Norton, Ohio, and did a little two-mile photo-walk. 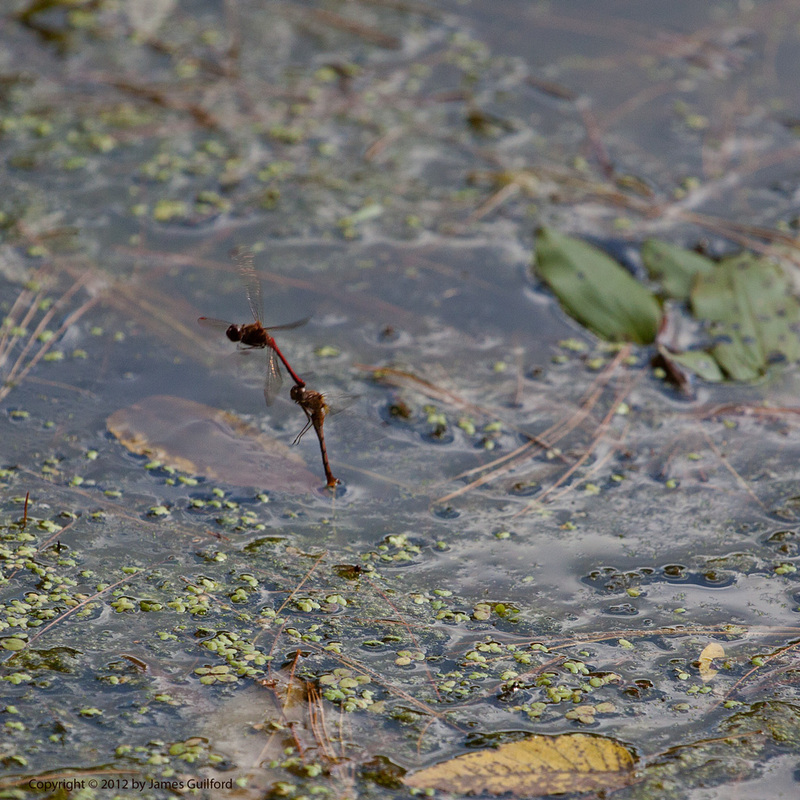 Around Piny Lake we spotted tiny dragonflies darting about, several coupled. I got my first images of coupled dragonflies in flight and my first shots of egg-laying activity! The (I believe) Yellow-legged Meadowhawks mate in the same fashion as other dragonflies: the male grasps the female using special pincers at the end of his tail, mating proceeds, and then the couple fly over water and she dips the end of her abdomen into the water repeatedly, depositing her fertilized eggs. It’s an amazing and very quick dance, difficult to follow and more difficult to image in the field; I’m glad for whatever measure of success displayed here! 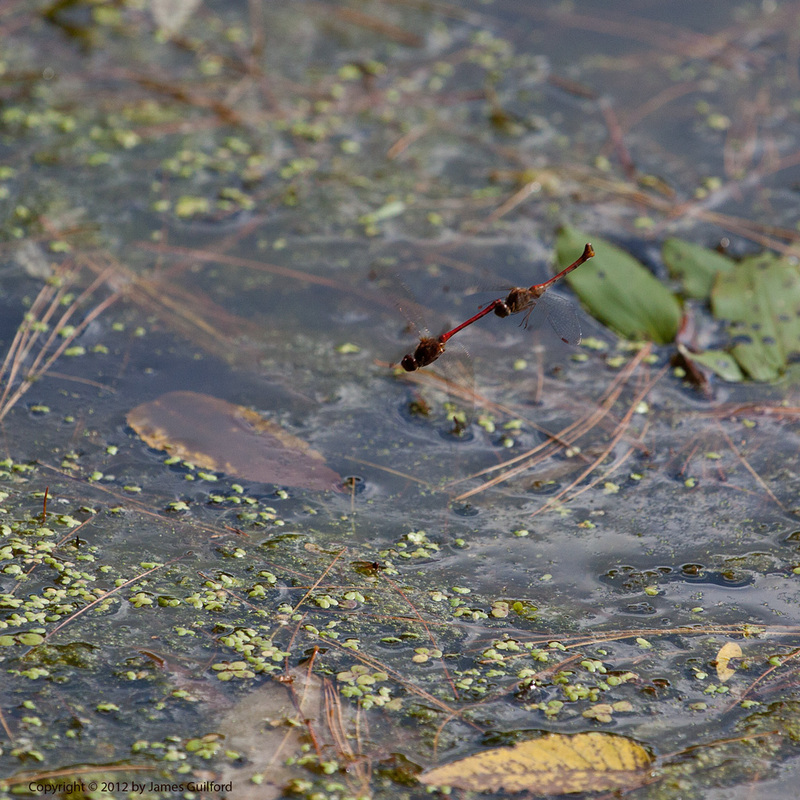 Male (upper) and female Yellow-legged Meadowhawks as she deposits her eggs in pond water.